It’s been just over a year since I began working with the Theodore M. Berry papers and in that time this collection has become a part of me in a way I never guessed it would. I have learned about 20th century American history and the black experience in a way that no history book or classroom setting could ever duplicate; I have gotten an insider’s look at the US government during the civil rights movement; and I have come to know a man whom I never had the opportunity to meet but whom I greatly admire. This will be my last blog post for this project and, though I am sad to be leaving, I know that this collection will always be with me in its contribution to my education and understanding of the world. Today would have been Theodore M. Berry’s 106th birthday and thanks to his family and UC President Gregory Williams, we have an additional reason to celebrate his life. 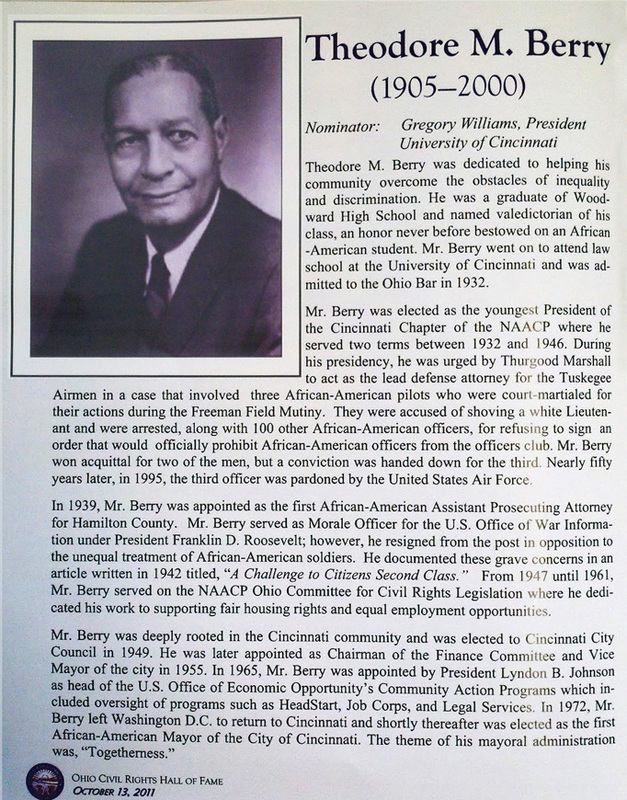 Dr. Williams nominated Berry for induction to the Ohio Civil Rights Hall of Fame earlier this year and on October 13, 2011 he was officially inducted at a ceremony at the Ohio State Courthouse. At the ceremony Judge Ted N. Berry spoke on behalf of his father and the rest of the Berry family. In his speech he mentioned some of the countless contributions his father made to the lives of minorities and the underprivileged in Ohio – those deeds which will forever be remembered as having changed the course of history. But more potently, Ted spoke passionately of his father’s attitude and of the philosophy which drove those deeds. “Plead the cause of the poor and the needy” he would say. And that is his legacy. In 2010, the University of Cincinnati Libraries received a $61,287 grant from the National Historical Publications and Records Commission of the Archives and Records Administration to fully process the Theodore M. Berry Collection in the Archives & Rare Books Library. All information and opinions published on the Berry project website and in the blog entries are those of the individuals involved in the grant project and do not reflect those of the National Archives and Records Administration. We gratefully acknowledge the support of NARA.